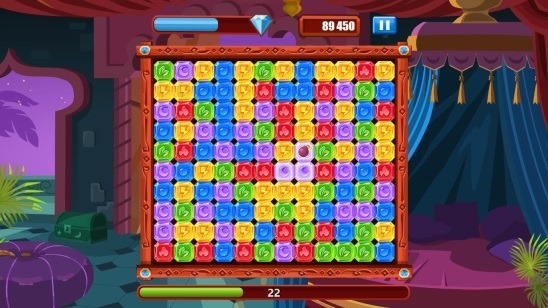 Diamond Dash is a popular diamond matching game in which you have to match maximum number of same-colored diamonds either horizontally, or vertically. The diamonds should be adjacent and not less than three in number. Diamond Dash game was initially developed for Facebook and smartphones, but now it’s available as a Windows 8 app also, that too for free. You can get Diamond Dash game app on your Windows 8 device from Windows Store and enjoy playing with it the way you do on your Apple iPhone, Android, or Windows phone. This free diamond matching puzzle game is developed by Wooga (which develops free to play browser based online games for social networking sites e.g Facebook). This free Diamond Dash game app is present under the Games category in Windows Store, or in case if you couldn’t find the app then, you can also make use of the Windows Search Charm (Win + Q) and search using the game’s name in the Windows Store . This app is a great arcade type game app and is a good medium to kill some time. Like said before, your objective in the game is to clear as many same colored diamonds as possible. The matching colored diamonds have to be at least 3 in number, otherwise they won’t get cleared. You’ll get 60 seconds to clear as many diamonds as possible. So you have to be quick, or else you won’t get good scores. To play the diamond dash game, simply click on those diamonds which have 3 or more same colored diamonds next to itself, and they will all get disappeared. Cleared diamonds are replaced from those which will come on the top. Clearing diamonds gives you points (coins and stars), and ultimately raises your level. 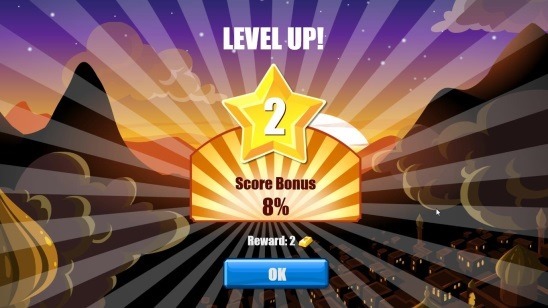 You’ll get different power-ups during game play, which helps you to clear diamonds faster. You’ll get five consecutive lives; each live gives you one shot to play the game. Once they all get used up, you will have to wait for some time. The lives will then automatically gets added to the game. 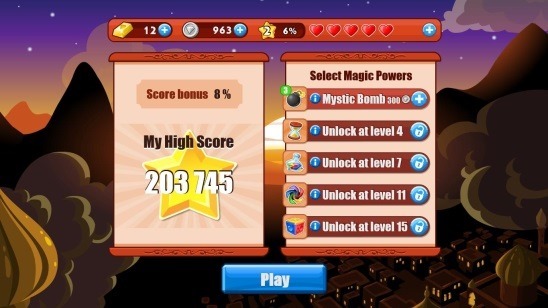 The gold and coins that you earn during the game are used to buy different types of magic powers and lives, which you can use during the game. You can also buy gold and coins by paying real money. The gameplay of this Diamond Dash game app is of good quality. Graphics are fine, and the animation is quick and smooth. But, paying money to get more gold pieces and coins, is not a good idea as the game itself awards you with them after completion of each round. So invest it only if you are in urgent need of silver coins and gold pieces. Good version of the original Diamond Dash game for Windows 8. Multiple magic weapons to be unlocked. Supported in smartphones and other devices. Interesting enough to keep you glued. Diamond Dash game is one nice free game app to get on your Windows 8 device. The game is pretty straight and simple, and there’s no crazy twists in the game. Plus a cute panda guiding throughout the game looks interesting. It’s sleek, quick, solid fun, and totally addictive game to try your hands on. Get Diamond Dash app here.